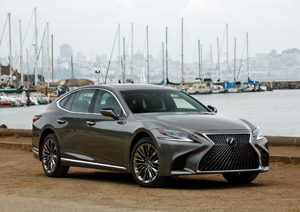 The 2018 Lexus LS 500 is all new, and it is ready to take Japanese luxury to a higher level. The flagship of the Lexus brand is longer and lower than the previous model giving it a coupe-like silhouette along with an exterior design that is strikingly bold. This big sedan is going to turn heads and lure customers away from those German luxury brands that usually enjoy a very loyal clientele. The Lexus brand first appeared in the US twenty-eight years ago. The face of that brand was the first generation LS. Designed from the ground up to appeal to car buyers who wanted a highly reliable, luxury vehicle that demonstrated a certain quiet appeal, the LS was a departure from American and European big sedans. But, this fifth generation LS is no longer willing to remain quietly in the shadows. This car is a bold statement from front to back. The base rear-wheel drive LS has an MSRP of $75,000, which is about $15,000 less than the base Mercedes-Benz S-Class sedan. The standard engine is an all-new 416 hp, 3.5-liter twin-turbo V6 engine designed specifically for the new LS and is smaller but more powerful than the previous generation’s powerplant. Mated to a new ten-speed automatic transmission and delivering EPA estimated fuel economy numbers of 19 mpg in the city and 30 mpg on the highway, it will get you from 0-60 in 4.6 seconds, which is awfully fast for such a big car. For buyers looking to save fuel, there’s a hybrid version. The LS 500h gets 25 mpg city and 33 mpg highway. And for those drivers looking to maximize their driving excitement, there’s the performance-oriented LS F Sport, which transforms the four-door sedan into a two-door coupe. This F Sport gives the much more expensive Mercedes-Benz S560 AMG a serious run for its money. The LS’s interior fit and finish is just spectacular, nothing less than you would expect from this top-of-the-line Lexus. Both front and rear seats are available with an optional Shiatsu massage feature. Add the Executive Package option, and you’ll get rear seats that recline. For drivers who love the convenience of a heads-up display, the LS offers one that is 24 inches wide, the largest one available anywhere. This latest Lexus LS is simply fantastic. Its’ refusal to compromise puts it on par with every other luxury sedan in its class.